Seaspray uses NuVet Plus and NuVet Hip & Joint Therapy for all of our Breeding Dogs and new puppies. Order by clicking either image below. 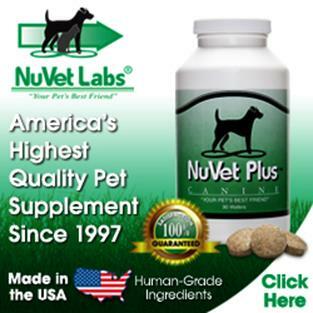 NuVet Plus for Canines and NuJoint Plus for puppies and dogs provide the very best human-grade, natural ingredients available, and utilize the latest advances in medical, veterinary, and nutritional science. Save 15% if you set up autoship. NuVet Plus is Natural – No Artificial Sweeteners or Fillers - only Human Grade ingredients.